Do you have any idea about the technical and performance difference between Bose SoundLink Mini 1 vs 2 ? When you want to buy a wireless Bluetooth speaker, you may fall into different questions about its make, sound quality, its pros and cons and the salient features between these two speakers. Should I Buy Bose SoundLink Mini 1 or SoundLink Mini 2? 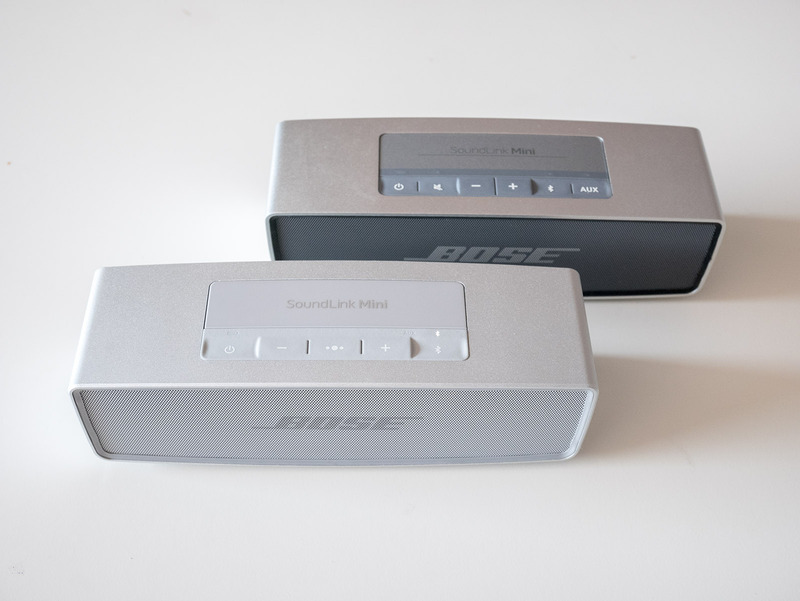 In this article, we shall discuss and compare Bose SoundLink Mini 1 and SoundLink Mini 2. Since the competitions grow day by day in the present market for the brands, the comparison between these two will help you to bring out the best choice. Being comfortable with both the speaker sets, they are known for having a lot of unique differences from one another. The following are some of the basic differences detected by our experts to choose the best one that matches your preferences. Below, you can find the pros and cons of each model to help you choose between Mini 1 and 2 based on your individual preference and option as well. Buy on Amazon If you click this link and make a purchase, we earn a commission at no additional cost to you. Bose SoundLink Mini 1 comes with a unibody aluminum structure, and hence it feels comparatively heavy. Its dimensions are 7.1 inches width 2.3 inches depth and 2.0 inches in height and weigh 1.5 pounds. The speaker is cute and stylish on appeal. The piece is sturdy, reliable that gives a premium feel. You will find it is worth of each penny you spend over it. The right size and compactness is better than any other plastic body speakers available in the market. SoundLink Mini 2 looks much like SoundLink Mini 1 in its appearance and experience. It is slightly curved with a brick of aluminum and compact enough to hold in one hand. It comes in 7.1 inches width, 2.3 inches depth and 2 inches height and weigh 1.5 lbs. SoundLink Mini 1 comes in a single color whereas Mini SoundLink Mini 2 comes with two color variations. Dimension wise, both of them match each other. In SoundLink Mini 1, it delivers pretty loud sound, and we find its mids and highs are excellent, appealing and produce amazing bass. 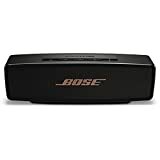 Bose Mini 1 cannot perform like a large speaker, however you can get excellent bass quality when placed close to the wall and considering its tiny size, it delivers performs better than any other speakers of this size. Whereas Bose SoundLink Mini 2 doesn’t support aptX a technology for high quality codec than the standard Bluetooth SBC. It cannot deliver such a massive sound, they how you expect to have from such a small sound box. However, Bose has maintained its sound quality in perfect tone in Mini 2. Considering the size of the box, the Mini 2 produces incredible bass and powerful sound, which has a slight edge over Mini 1. The control buttons on the SoundLink Mini 1 are easy to use and fabulous. The controls buttons placed on the top and everything made of rubber. You can find the buttons for increasing as well as reducing the volume. The power button and the mute button and two more buttons for Bluetooth and auxiliary buttons are present for the convenience of operation. In SoundLink Mini 2, you will find a power button; volume controls for increasing and decreasing the sound, a multifunction button, and a Bluetooth button. The most striking part of mini 2 is that on holding the power button it will signal the speaker to let you know how much battery life it holds. Similarly, the Bluetooth button will let you know what device the speaker is currently attached. The + and – buttons can use only for controlling volume and won’t aid in skipping tracks. A major advantage over SoundLink 1 and 2 is about the batter life. The SoundLink Mini 1 comes with the maximum battery life of 7 hours whereas Mini SoundLink Mini 2 offers up to 10 hours of battery life. It comes out with a charging cradle which makes the charging much more easily. Thus you can play music while the device in charge. It can also be charged using a wall charger. Unlike most portable Bluetooth speakers, the SoundLink Mini 1 doesn’t support MicroUSB port for charging, which will force you to carry the specified charger on travel. Whereas, you can charge SoundLink Mini 2 by using MicroUSB. The SoundLink Mini 1 supports a rechargeable lithium-ion battery and users can play continuously for 7 hours without any disturbances. Also, there is a stylish charging cradle which you can use at home. The positive side of it is that it can fully charge within 3 hours of time. 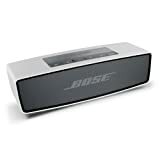 The Bose SoundLink Mini 2 is a great product that provides excellent bass and sound quality. It delivers deeper, more vibrant bass from a box that has the same sized drivers. Since there are several competent alternatives, you can look for a device with budget cost. It can charge with MicroUSB which is a unique feature over SoundLink Mini 1. If you don’t think you will use an extra speaker, then SoundLink Mini 2 may be your excellent choice. Also, it comes with a built-in speakerphone to answer the calls. It is a good choice for elder people who wish to answer the calls through the speakerphone. Bose SoundLink Mini 2 is an excellent choice for those looking for superior audio quality with a Bluetooth speaker. If you plan to use the speaker indoors, the sound impact is exceptional as if the sound comes out from a massive speaker. It’s one of the most fabulous choices for those who like great and striking audio effects. As you can find many cheaper alternatives for a stereo speaker, the SoundLink Mini 2 is the best choice for a wireless speaker in the present market. On the other hand, when you look into bass depth, build quality, and appealing sound make the SoundLink Mini 1 an outstanding device at this affordable price with good quality audio preferences. On comparing all these features between both Bose SoundLink Mini 1 vs 2, the better and excellent choice would be Bose SoundLink Mini 2. Using my phone with Bluetooth why could not you buy two mini 2 bose sounding speakers, and wouldn’t the signal go to both, or when you pair you have to use a wire. Bose QuietComfort 15 vs 25 vs 35: Which Should You Buy? Bose SoundSport vs Powerbeats3 – Which One Should You Purchase? Soundgears.net is a participant in the Amazon Services LLC Associates Program, an affiliate advertising program designed to provide a means for sites to earn advertising fees by advertising and linking to Amazon.com. Additionally, Soundgears.net participates in various other affiliate programs, and we sometimes get a commission through purchases made through our links.